Its true Bigfoot could migrate anywhere like bears do. Only difference is we have more than enough evidence that bears exist. All over the country. No one questions the existence of bears. But as far as bigfoot goes we don't have one substantiated photo or video or any DNA evidence that proves it. I can't prove bigfoot does not exist but neither can someone else prove that it does. The clearest video, the Patterson video was a admitted hoax. That is very damaging. I think the Patterson video is an alleged hoax; the evidence consists of people claiming to have been involved in a hoax, but I don't think there's a smoking gun showing it's a hoax. The attempts I've seen at recreating the video have not been particularly convincing. I don't think we'll ever know for sure which of the parties in these claims and counter-claims was telling the truth. 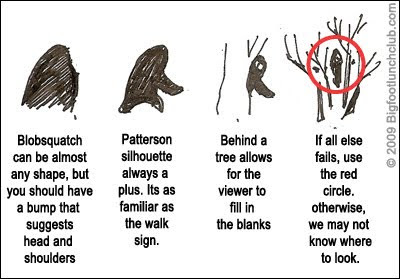 Forty years ago (as I've said several times in the past in this forum) I would have given a better than 50% chance that bigfoot was a real undiscovered primate; today I believe that figure is below 5% for the reasons you state. Regarding the Alabama booger video -- interesting and very creepy, but hard I think to say what it is (or to find convincing evidence in the clip that it's not just some sort of hoax). By the way, there have been bigfoot sighting reports from many locations - and I've seen maps comparing the distribution of black bears vs. these sightings and they're quite similar. Ok, I guess you can call it alleged. The biggest reason that it is a hoax to me is no one since has come up with anything like the patterson video. And I am sure countless people have been looking. If there was a bigfoot how on earth would he catch a deer with his bare hands? Do bigfoots have shotguns? I have spent time in the woods all my life. You can't get that close to deer and they would be way faster than any 8 foot tall bigfoot. The people who know about this say that bigfoot throws stones and stuns them, then breaks their leg so they cannot run off. In this case it may have decided to drown it rather than break its neck. Who knows why? Why should there be reported two bigfoot at the scene too? By the way, there have been bigfoot sighting reports from many locations - and I've seen maps comparing the distribution of black bears vs. these sightings and they're quite similar. And now ask yourself how many bigfoot sightings there are across the world by different cultures and people. What of the physical evidence of huge hand & foot castings and audio recordings from around the world? People continue to use trail cams to think they can capture bigfoot on camera but what if it can see in the infrared range of the spectrum? We use IR to see in the dark, not many people consider any other way to take pictures in a dimly lit place. What is it that would be revealed if bigfoot was proven to exist? Why would the authorities NOT want to investigate properly and find out? What is stopping them from doing that when we have far more evidence for bigfoot than we do for many of the scientific investigations financed and going on today serching for new species in exotic places. Yet... nothing official has been done. Why? No one is stopping a group from getting funds together to investigate bigfoot. Scientists do not work for free. I would imagine most scientists think the whole thing is baloney and not worth their time. But money talks. Why don't you work on this? Seems to be a topic of importance to you and instead of lamenting that no one is doing this properly do something. Raise the money, hire the pros and perhaps you will find the truth. And there is no physical evidence proven to be from Bigfoot. No DNA proof. No remains. But a lot of fake stuff that explains most if not all of your so called physical evidence. We find fossils from millions of years ago. But no bones from a giant 8 foot creature that you claim is walking around today. I didn't create the video..... I live 400 miles from where the video was created. You posted the video here. All of which could be faked. Many of which have been proven to be fakes. What is stopping them from doing that when we have far more evidence for bigfoot than we do for many of the scientific investigations financed and going on today searching for new species in exotic places. Yet... nothing official has been done. Why? Official expeditions to investigate sasquatch/yeti have been done, both in North America and elsewhere. My college anthropology teacher was part of one in Nepal. A better question might be: Why do so few universities fund sasquatch/yeti expeditions? The answer is pretty simple: It's the same reason why so few universities fund expeditions in search of unicorns, gryphons, hippogriffs, etc. Because there is not a enough evidence to suggest a search if worth the funds. But amateurs and TV shows have continued searching for Bigfoot for decades. Their conclusive evidence to date? Zip. Not a single bone or tuft of hair or corpse or pile of poo or DNA sample or even a decent photo. Just lots of plaster casts of footprints and photos of blobsquatches. Many fossils of giants. Trouble is, the religious folk have kidnapped the whole subject and claimed it for their own. Look up "fossils of giants"